NeoPack/Professional allows the user to specify a pose number or pose label for an image hole on a template. When this layout is subsequently ordered for a particular subject, the correct pose will be used in the image hole. If poses have not been assigned for a subjects' images the layout will use the primary image. Where a template has multiple image holes, the user can specify a different pose for each image hole.Conversely the same pose may be used for different image holes on the same layout. Using poses in these two ways allows for a more creative approach to package printing. A package print need no longer contain just one image repeated several times. Furthemore the same image hole may have multiple pose numbers or pose labels. This alllows the same template to be used for different jobs. 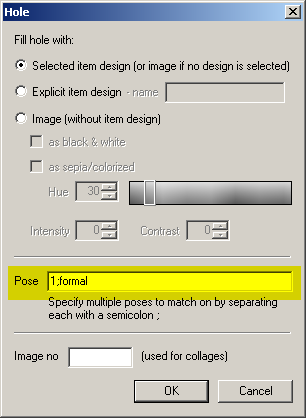 In the screen grab below, the image hole is being assigned both pose number "1" and pose label "formal". Note the use of the semi colon as a separator.